on verso signed, titled, dated 12/1966 and inscribed "Cat No. 36" on two labels and "G.M. - T- 1966"
In 1966, when Guido Molinari displayed his Rhythmic Mutations in a gallery in East Hampton, New York, he was only 33 years old, but he had already come a long way. This was his 10th solo exhibition - his third in the United States - and since 1954, he had been giving himself very short deadlines. 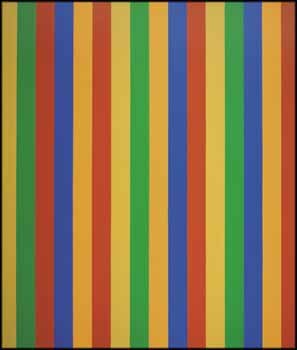 It was not until 1963 that he discovered the spatial structure that met all his requirements: paintings with vertical stripes of equal width, a pattern that allowed him to speak exclusively of colour, rhythm and energy. He stuck to this single composition until 1969. Furthermore, there was a happy coincidence that occurred in his life: this was the time when Molinari decided to considerably enlarge his workshop through the demolition of a wall in his house in Ville Saint-Laurent, which enabled him to make much larger paintings, more likely to reach the full potential of his new spatial concerns. The 1960s were very prestigious for the painter, a decade in which he experienced his most brilliant successes: in 1965, he participated in the important exhibition The Responsive Eye at the Museum of Modern Art in New York, and three years later, he represented Canada at the 34th Venice Biennale, where he won the coveted David E. Bright Foundation Award. In these years, he also presented a first retrospective of his work in Regina and in Vancouver; he was a grantee of the Guggenheim Foundation and was the laureate at the museum’s Spring Exhibition in 1965. In short, he participated in countless events of major importance in Quebec and Canada, but also in the United States and Europe. This canvas, entitled Mutation rythmique rouge-orange (Red-Orange Rhythmic Mutation), was part of the great retrospective organized by the National Gallery of Canada in Ottawa in 1976 and which traveled during the following year to the Montreal Museum of Fine Arts, the Art Gallery of Ontario and the Vancouver Art Gallery. The curator of this show, Pierre Théberge, one of the leading connoisseurs of Molinari’s art, had selected two dozen works from this period, which gave a good idea of the extreme diversity of the work. This section of the National Gallery of Canada’s retrospective paradoxically showed a Molinari crazy for colour, playing with the width and serial repetitions of his stripes as would a musician or a poet. Needless to say, music and poetry entered the head and heart of Molinari at the same time as drawing and painting, and they remained there until the very end (as evidenced by his latest exhibition, inspired by the poem by Stéphane Mallarmé, “Un coup de dés jamais n’abolira le hasard,” and the existence of the Molinari Quartet). We thank Gilles Daigneault, executive director of the Guido Molinari Foundation in Montreal, for contributing the above essay.